I planned to ride to Darwin to take part in the Long Ride 2010. Why not start the ride with a SS1600. Wifey signed off as a start witness and waved farewell at 04:50 May 5th. Then off to the hole in the wall. My ride start docket had a start time of 04:56:04 and my bike ODO reading was 54,343. I headed off towards Port Augusta. Need to remember to take a right turn there. The morning was fine and I had summer gloves on when I left home. I kept a vigilant eye out for Roo’s and other animals that seem to throw themselves in front of vehicles. I was lucky to only see 2 Roo’s and they were both at a distance. Otherwise just a few Rabbits and a Fox At around 6am I could see the first hints of morning light starting to appear in the mirrors. I stopped for a quick snap at about 6.30am. Stopped at Wilcannia to take a photo of the Darling which has risen more since I drove through in March. Filled up and off to Broken Hill. Stopped in Broken Hill at about 08:45 (SA Time). Grabbed a bite to eat and waited for Bazz’s shop to open. I hadn’t finished my sandwich when one of Bazz’s assistants opened the front door of his shop and wandered over and chatted for a moment and then I said I was here to pick up my beloved FarRiders Cap that I had left at Lightning Ridge the week before. Thanks Ian and Bazz. Filled up and off to Port Augusta. Started to get quite windy around Broken Hill and was threatening rain at Peterborough. A few spots but managed to dodge the worst. I know I have stopped to take a picture of the Banner shot before, but what the hell I done it again. Fuel stop at Peterborough and Port Augusta and remembered to take the right turn at Port Augusta so things are looking good. More fuel at Glendambo. Stopped on the way to Coober Pedy for a sunset shot. Into Cobber Pedy And fuelled up. I was feeling great. Asked the attendant what the road was like through to Marla. “No go Mate. She’s still blocked”. Why the hell is it blocked I asked. “because of the Accident mate, 3 fatalities and 2 critically injured”. Bugger. My issue of not being able to get to Marla suddenly seemed very small. I seen the flashing police lights up the road as I turned into Coober Pedy and went to talk to them. Seems likely the road would be closed into the next day. The SS1600 attempt now history, I booked into the caravan park. 1450 km for the day. Up and on the road again by about 5am. Another sunrise. Stopped at Marla for breakfast. Did not see any sign of an accident on the way, but most of the road was ridden in the dark. After starting again from Marla I heard a few Truckies on the UHF say they did not see anything on the road either. I still don’t know what exactly happened to the poor buggers. Just enjoying the ride now. Into Erldunda for fuel then onto Alice Springs. Isn’t the 130km/h a great speed to cruise at. I started to do some calc’s in my head and thought I could still get a 2,500 in 36hrs with this speed limit. Pushed on further to Tennant Creek. Tenant creek was 100 km further then for the 2,500km I needed but the fuel stop prior was 30 km short of it. Pulled into Tennant Creek refuelled and into the shop to pay. Waited patiently for 2 young local girls to get their bags of lollies. You know the story, one of these and one of these etc. Paid and checked the time stamp. 16:27:49. Add the 30 minutes from EST to CST = 36hours 1 minute and 45 seconds. 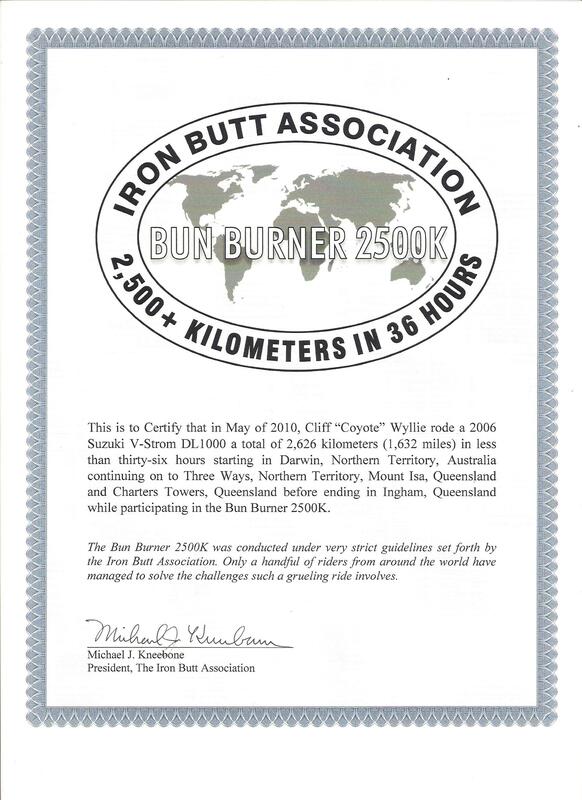 Thought for a second or 2 that I had done the 2603km and surely the IBA would understand. No, rules are rules. I was late. I rode out of Tennant Creek smiling because I was not really that worried about the IBA rides as I was simply enjoying the ride in the country. I had thought that the centre would be worse then the roads out in western NSW. Not so. The scenery changed often and while you would not say the road up the centre is twisty it does have some nice sweeping bends and dips to keep your interest. Up until Ti Tree I had not seen any wild life on the roads. In fact I had seen no real problems with Roo’s, Pigs, Emu’s etc. However the cattle wondering around on the road are something to keep in mind. Several cows laying dead on the side of the road. A sobering thought for riders travelling at night if they dare to do 130kph. I continued on to Dunmurra. It had been dark for some time and it appeared to be good Roo country so I decided to camp there the night at the Pub. Had a great feed of Thia red chicken curry. Washed down with an ale or 2. Had a bit of a sleep in, but still managed a sunrise shot. On the road by 6am. The ride to Darwin was uneventful but you would never guess who happened to be in the neighbourhood when I got there. Yep. Ghostrider and Mosey Angel. Paul and Alison. Camped at the Niece and Nephews on the Friday and Saturday nights. Rode out to Adelaide River With Nephew and joined the mob to ride back into Darwin. Went out to the charity diner on the Saturday night and caught up with Paul and Alison again and also watchdog. Must admit he (watchdog) has a nice rig (and spoilt dogs back home). Received the best outfit award. Well done mate. On the road again Sunday Morning. Had a start witness form signed off by Chris (My niece’s husband) just in case I feel like doing an IBA ride. Another sunrise around Adelaide River. Crossed into QLD at sunset. Pulled up at Mount Isa. Camped the night. Smelter stack at the Isa. Another Sunrise Ya gotta love the name of this Motel! Into Townsville and took a left turn ended up at Ingham. Checked end docket. Yep under 36 hours. Gentleman at the Roadhouse signed off on the finishing witness form. Have yet to check the paperwork, receipt etc. But think I have nailed it. Stayed in Townsville the night and on the road at 5.30am. Was about 40km south of Aye and got a call on the Mobile. I had left my credit card at the motel. Bugger. Turned around to retrieve it. Silly thing to do but I was over it before I I even turned back. I was on Holidays and in no hurry. After this it was a cruisie ride down the coast taking a few IBEM pictures. Camped at a park just south of Rockhampton. Top spot if you need to stay somewhere there. Webs heavy with dew south of Rocky. Picture really doesn’t do them justice. Caught up with my Sister in Brisvagas. A few more IBEM pic’s and stopped the night at Casino. My, it was a bit fresh the next morning. Off at 6am. Pulled up at Drake for a coffee and breakfast. Also to give the roads some time to defrost. Heated Grips are a blessing. should have put them on years ago. Foggy valleys on the way from Drake to Tenterfield. Rode up to Tenterfield and then down the New England. The amount of roadwork being conducted on the roads at the moment is frustrating. But I guess its for the better. I called my Manager from Nyngan to meet me at Hermidale. I resigned from my job there. Start the new job mid next month. Not sure why I put this photo in Back in home territory. Home at 6.15pm. ODO meter reading = 64,772. Total off ODO = 10,429km. GPS = 10,114km. I could have included much more like the rain at Mackay and the mad teenagers who’s cars suddenly develop 500+ HP. Or the Croc in Darwin that’s looking for a set of headphones to go with my Ipod. But I will save those stories for some other time. Best fun I’ve had for years. Wifey asked if I would do it again? I said yep, but next time I turn left at Katherine.